Day 130: A Zestos For Life . . .
How many of you remember buying record albums? You know, vinyl? There was a time – not so long ago – that people waited overnight, in lines, for the opportunity to buy the first issue of a certain album. It really didn’t matter who the artist was . . . Elvis, Jimi Hendrix, Black Sabbath, The Eagles (ok, so maybe not John Denver – who happens to be Jean’s favorite) . . . they’ve all had their share of ‘groupies’ over the years. And, those of us who grew up on the album rock craze still have fond memories of turntables with needles set-oh, so perfectly, and a ‘Disc Washer’ that took care of all of the nasty dust and grime on the album surface to make the sound PERFECT! Another part of the album rock craze was the album cover. Now, this probably dates back to the sixties and early seventies, but the artwork for album covers was drawn – in most cases-by hand. Very rare was the photo of the artist used for the album cover, oh sure, you’d see the photography for a hit 45, but rarely for the album. The more dramatic the look, the more likely sales would benefit. Brian is still a huge fan of The Moody Blues. He acquired his love for the band after pilfering – uh, stealing – no, borrowing for keeps, his brother’s “In Search of the Lost Chord” album from 1972. If you’ve never seen this cover, it’s an artistic genre unto itself. But, that’s the way album covers were made back then . . . yes, you knew that the music inside was going to be good, but the cover — oh, man — the cover was a big reason why you bought the album. Unlike today, with all due respect, it’s nothing and we mean NOTHING compared to the golden era of rock. As a side note, Brian had tickets to see The Moody Blues in late June of 1993 . . . the same year that our youngest daughter was born — in early July. But, (and this is a shout out to all of the ladies who are pregnant in the summer time), the last thing Jean wanted to do was sit on a blanket – on a hard ground-in the heat of a St. Louis summer listening to a band. So, Brian went with Jean’s co-worker (hey, Michelle – do you remember??) and that night, The Moody Blues played with the St. Louis Symphony Orchestra – and every Moody’s song since then has sounded just like it did that night. It was perfection multiplied times ten! WOW! And, to add to the enthusiasm, we really liked this wine a LOT. It’s lighter than we’re normally accustomed to tasting, but the nose, the fruit, the palate and the finish are out of this world! We are beginning to see the incredible value in wines from Spain; some are so big and bold while others are subtle and sneak up on you. This one seems to fit perfectly in the middle and we think that you’ll really like it. It’s kind of cool when review after review reaffirmed our thought that this is a lot of wine for the money. Yep, this hidden gem is around $10 a bottle, but you’ll be hard pressed to find any wine at this price with this kind of taste and value. Oh, and the label artwork is stellar. 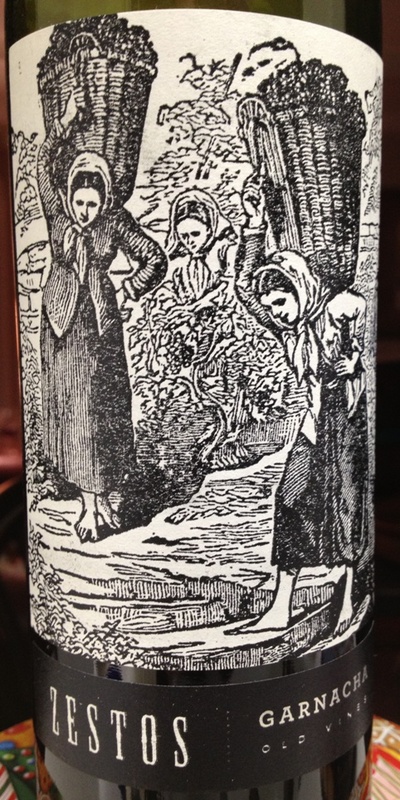 Great detail in a wine label is hard to come by. You’ll be impressed with the label, the bottle and most importantly, the wine. We hop you’ll give this one a try. Regardless, please enjoy your favorite wine responsibly and remember to recycle whenever possible. Categories: Uncategorized | Tags: granache, Moody Blues, Robert Parker, St. Louis, vinyl records, Zestos Wine | Permalink.